In 2012, representatives from the City of Chicago Department of Public Health, Illinois Emergency Department Asthma Surveillance Project, health systems, clinicians, not-for-profit community organizations, and researchers in Chicago participated in the Chicago Emergency Department Asthma Summit to identify opportunities to address the needs of at-risk populations with asthma. Participants in the summit agreed to collaborate in a multi-year Coordinated Healthcare Interventions for Childhood Asthma Gaps in Outcomes (CHICAGO) Plan, with an initial focus on evaluating promising strategies in minority children as they present for care to the ED with uncontrolled asthma. The CHICAGO Plan was designed to improve the health of children with uncontrolled asthma. It is a research study to compare traditional emergency department care with enhanced care and home-based interventions to learn which produces the best outcomes for children. 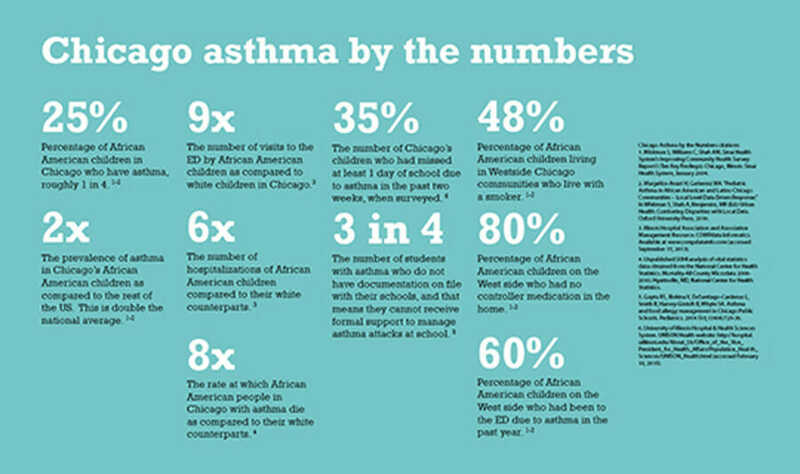 The CHICAGO Plan spans Chicago’s south and west side neighborhoods, which are the hardest hit by asthma. Chicago has among the highest asthma rates in the U.S.
Chicago’s asthma problem is severe. Our hospitalization rates are nearly double the national rate. African American and Latino families living in Chicago’s south and west side neighborhoods bear the brunt of it. The burden falls most heavily on their children. Today, the places where children get asthma care have weak ties to one another. The CHICAGO Plan learned there is a disconnect between the asthma care children receive in emergency departments and the care they get in clinics, at school and at home. This causes gaps and fragmentation in treatment. People who care for a child with asthma need a way to coordinate their care with others. They also need to share critical information. Listen to the story of a community health worker (CHW) who discovers a child having an asthma attack. CHICAGO Plan starts in the emergency department. CHICAGO Plan seeks to improve the health outcomes of minority children with asthma who visit the emergency department (ED). It compares three approaches to asthma care to see which is most effective. A new asthma discharge tool built by everyone, for everyone. 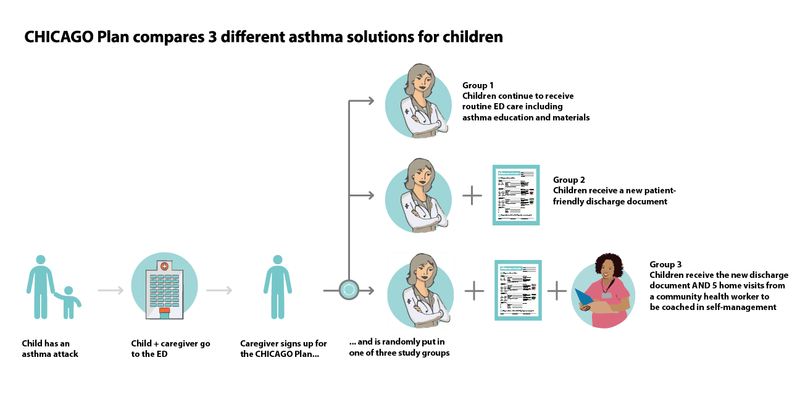 The CHICAGO Plan worked with communication designers to create a new asthma discharge tool. The designers worked with doctors, patients and caregivers to build a tool that is easy to read and use. It is designed to help everyone who cares for a child with asthma talk to each other about asthma management and asthma medicine. It is designed to work in the ED, at home, at school, and with families and outpatient doctors. CHICAGO Plan is a unique cooperative. The CHICAGO Plan built an extraordinary new partnership model in asthma care. It included caregivers of children with asthma and their families. It also included community partners, local asthma research experts, six hospital systems, and the Chicago Department of Public Health. Together this new cooperative worked to create a better approach to asthma care for children and reduce the health disparities seen in Chicago. To learn more about CHICAGO Plan, contact Erica Salem, Senior Director, Strategy, Programs & Policy, via email at [email protected] or by phone at (312) 628-0235.